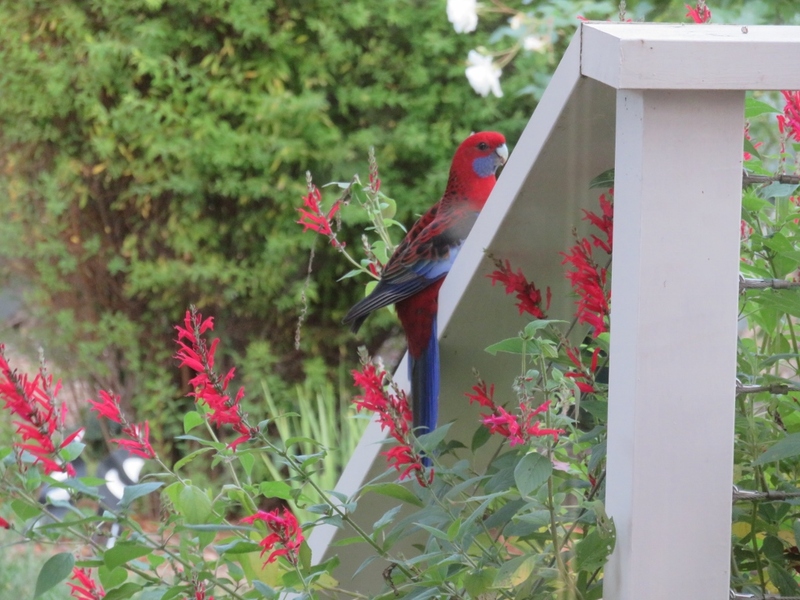 In our Canberra garden this beautiful Crimson Rosella is feeding on the nectar of the pretty Salvia elegans, or Pineapple Sage….the flower and the parrot are almost matching in colour. The sweet pineapple-smelling leaves and bright red tubular flowers of this plant can be used for cooking and medicinal purposes. However, for us, the joy of having this plant in our garden is to see the birds feeding on it in autumn. A few years ago I planted a little stick of Peppermint sage near the kitchen window, to protect it from severe frosts. I was surprised to see it survive the winter, and then to see it flowering so beautifully in late summer and all through the autumn. This dainty honey eater is called an Eastern Spinebill, and with its long curved beak it feeds on tubular flowers such as correas and grevilleas as well as the peppermint sage.I wish we could measure the energy this little bird uses as it eats and keeps its wings in motion at the same time…no wonder it is often mistaken for a hummingbird. 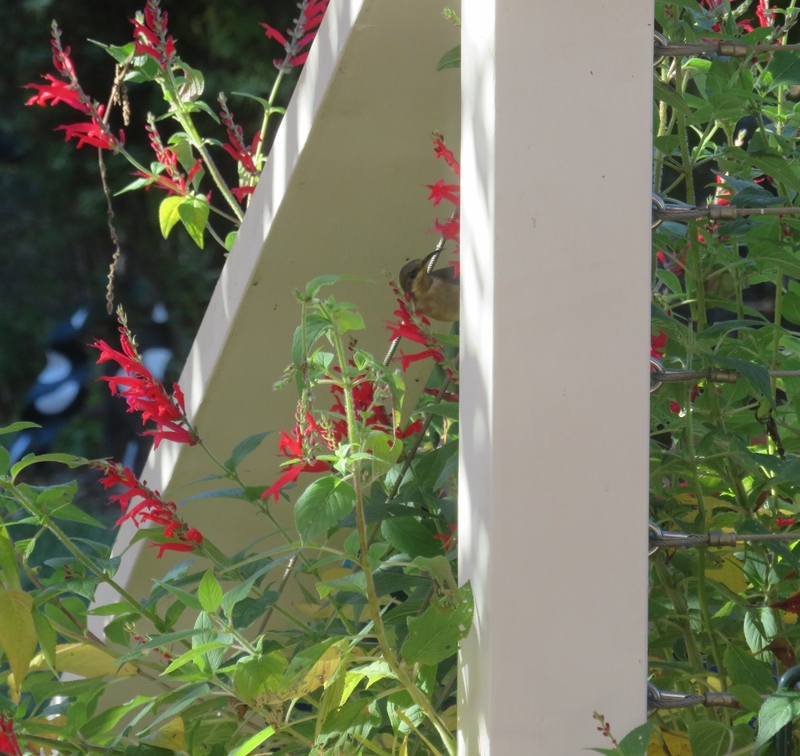 I have read that Pineapple Sage is irresistible to nectar feeding birds and butterflies including hummingbirds in New Mexico where this plant naturally occurs. Sometimes the Crimson Rosella shares feeding time with the Eastern Spinebill, and they both tolerate this pesky photographer hanging around but,…. if looks could kill……. 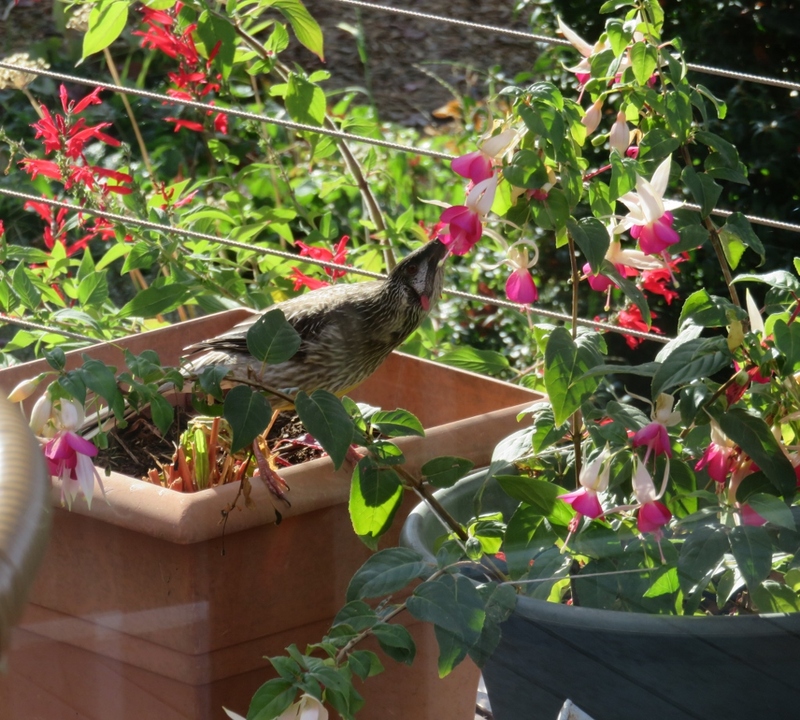 The Fuchsia is also flowering long after its usual time….and the Red Wattle is stocking up on nectar all round.. 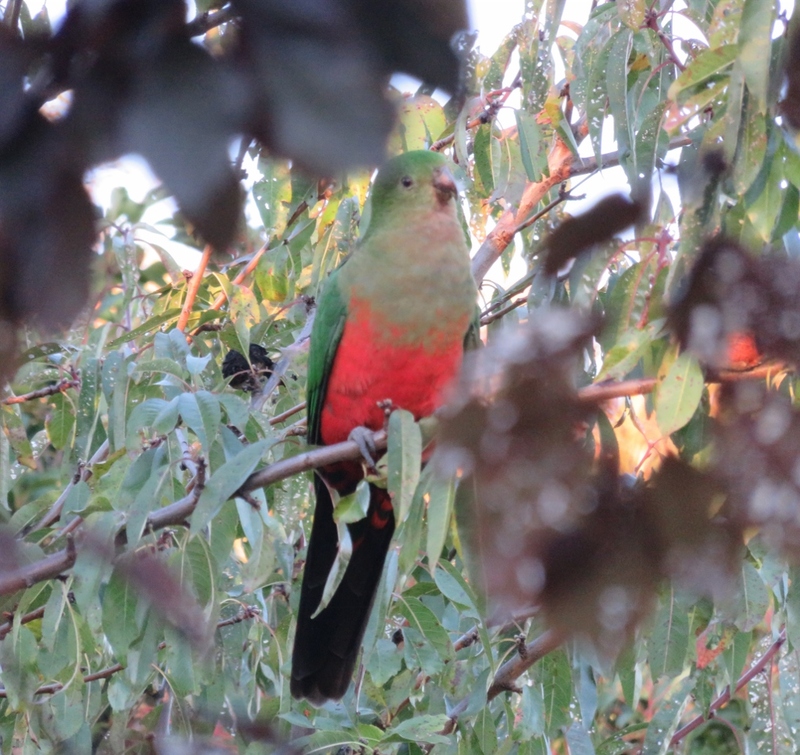 This shy looking young King Parrot is not a regular visitor to the garden, and probably hasn’t got the memo yet that this Almond tree is primarily a Sulphur Crested Cockatoo restaurant. 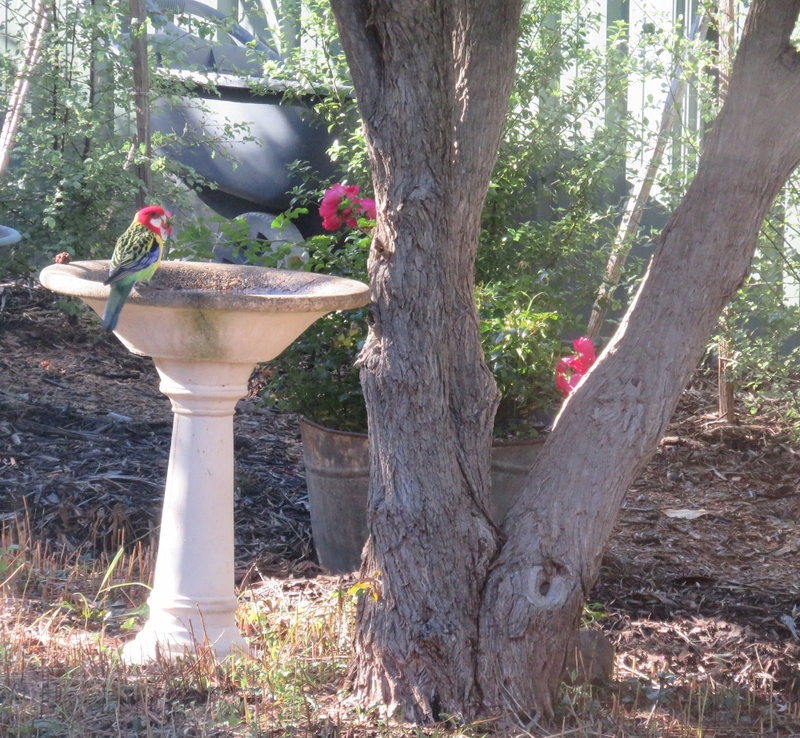 The colourful Eastern Rosellas are very cautious, the closest I have ever seen one in the garden is on our Japanese Maple, about half way down the garden path..
…the birdbath by the back fence is another safe spot. Today he has ventured into our front garden and is about to start digging around in our small bit of lawn for grubs…. …. well may he hang down his head.. 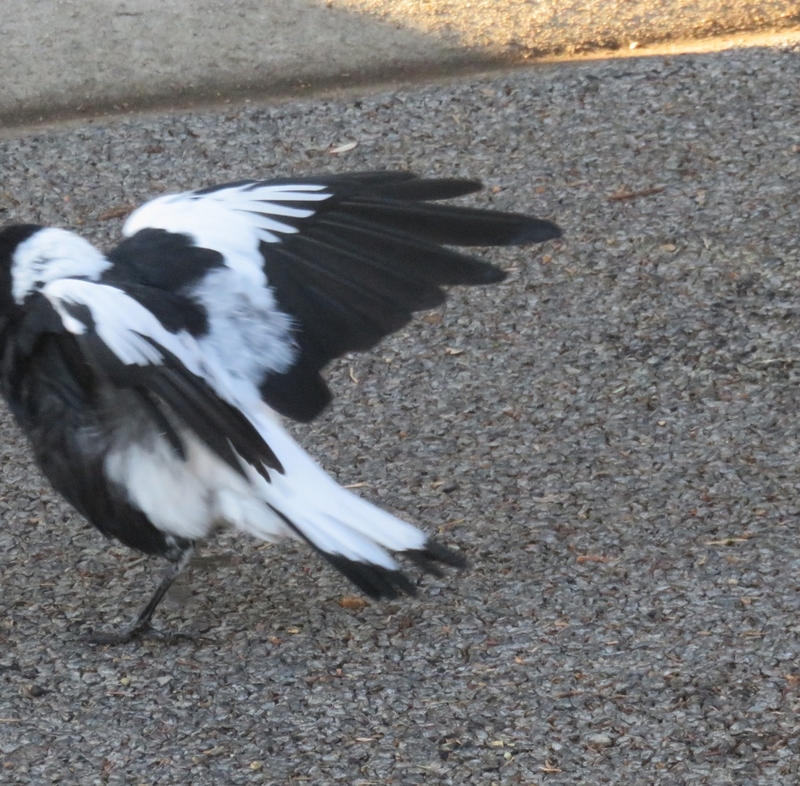 I love the way young Magpies put their wings out and run away from trouble, why not fly?? 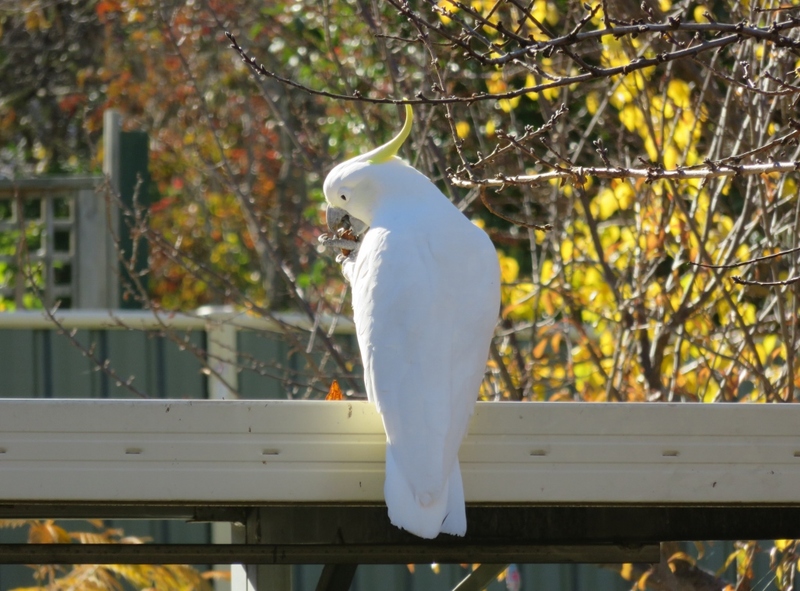 On this glorious autumn day there are still some almonds to eat…so all is well in this garden…. 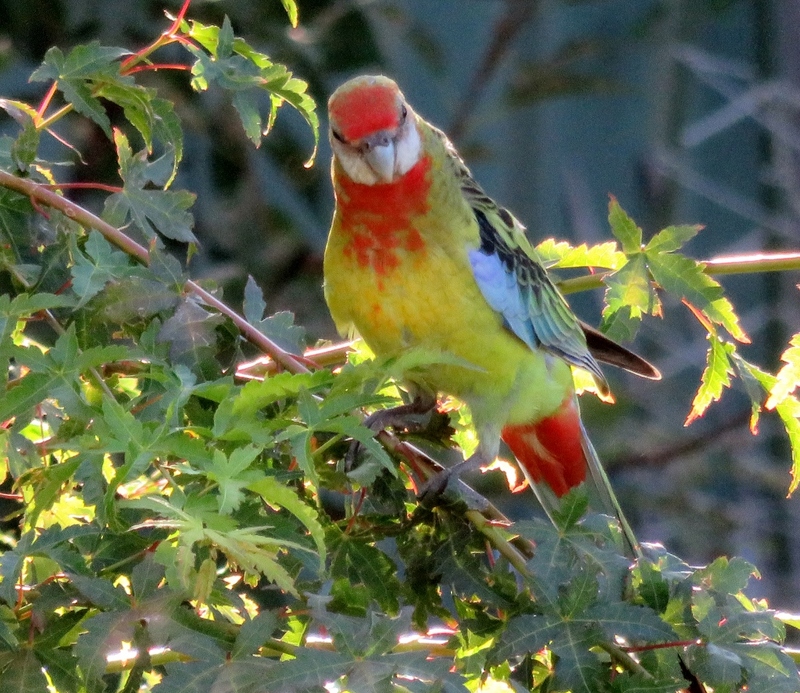 This entry was posted in My Place and tagged Canberra, crimson rosellas, Eastern Rosellas, Eastern Spinebill, fushias, garden, King Parrot, magpie, Peppermint Sage, Red Wattle Birds, Suphur Crested Cockatoo on May 24, 2017 by germac4. I love your bird photos, Gerrie. They have such character. Thanks Ruth, we are lucky to have so many of them. One could be forgiven for thinking that you live in the tropics with all those colourful birds. I don’t think we could match Queensland, but the parrots are lovely here. What a wonderful garden you have made, so full of colour. No wonder all those birds come to feed in it. Thank you for sharing such beauty. 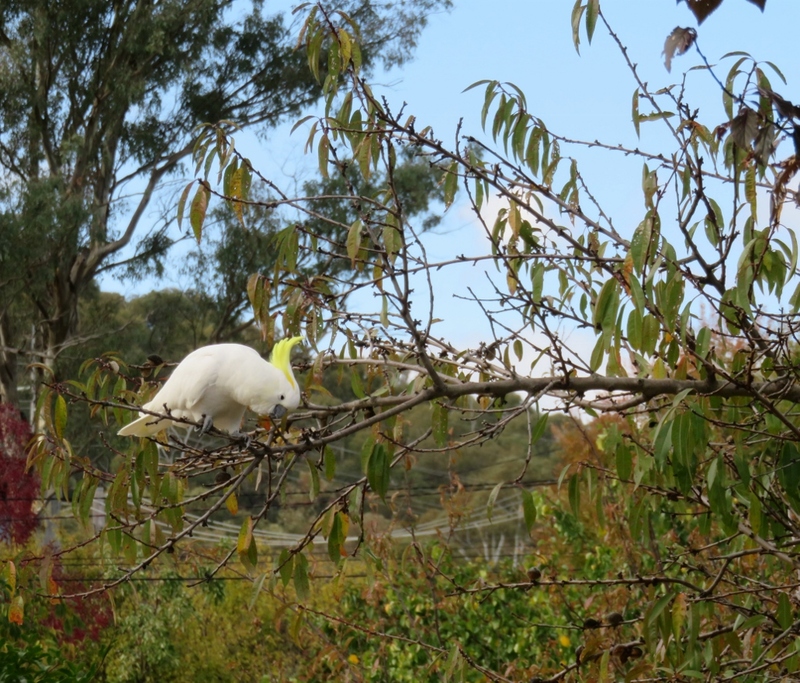 Canberra has a lot of bush between each suburb, and that helps bring the birds, which is lovely for us. Thanks Judy, yes I think the Peppermint Sage would do a backflip with all your snow! My pineapple sage is just beginning to flower, and looking battered. 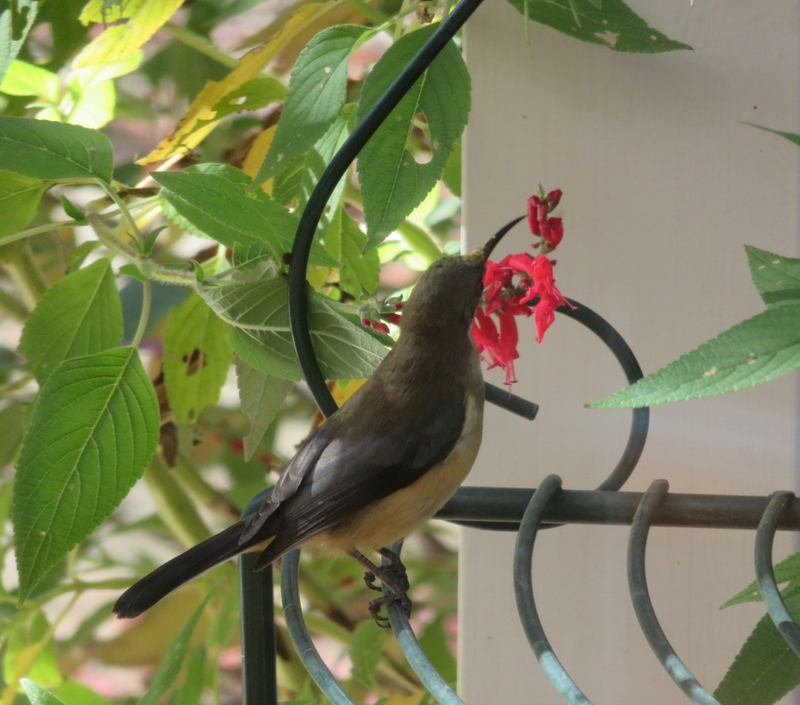 The sunbirds are devouring the flowers. If there is rain on the flowers, the birds come twice as fast! Your bird photographs are absolutely stunning. 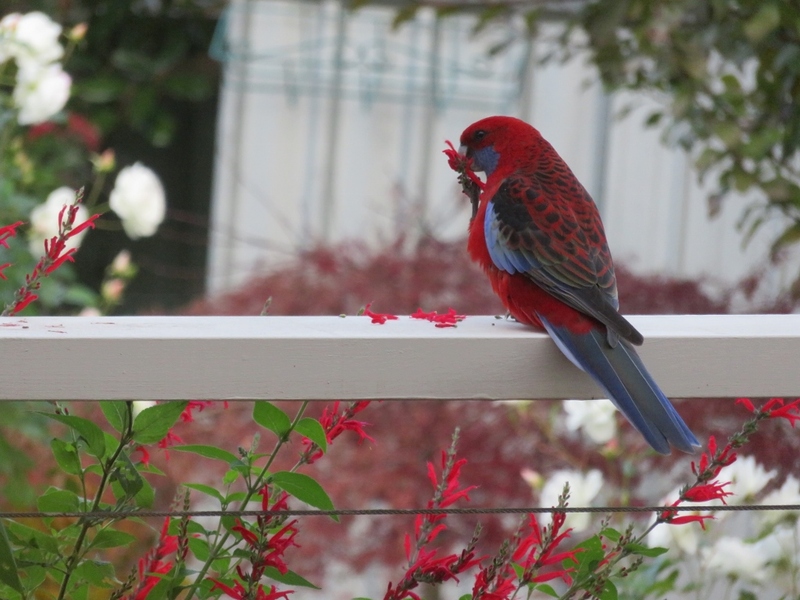 The red and blue coloration of the Crimson Rosella is incredible. Thanks, Jason and Judy, some of the photos had to be taken through the kitchen window.. Autumn looks to be beautiful for you, not least with the birds. Such colour! 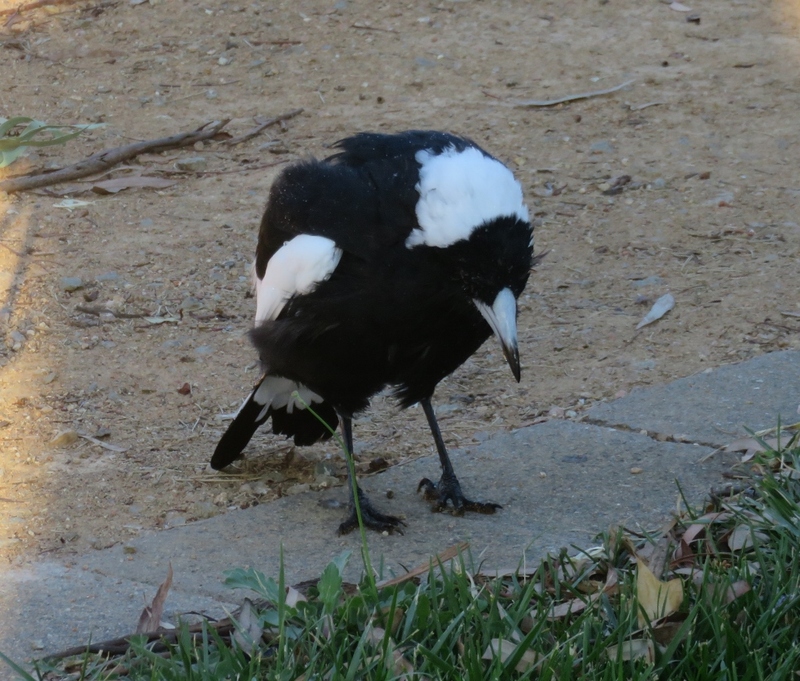 Thanks Dina, that magpie (although wild) is known as Baby Mags and he comes down from the gum trees for a shower when my neighbour is filling her birdbaths. I must try and get a photos of him, he loves the water. You are doing a good job helping the rescued rosella, I guess they feel okay as long as they are cared for. What amazing photos of the birds drinking nectar. Just incredible. 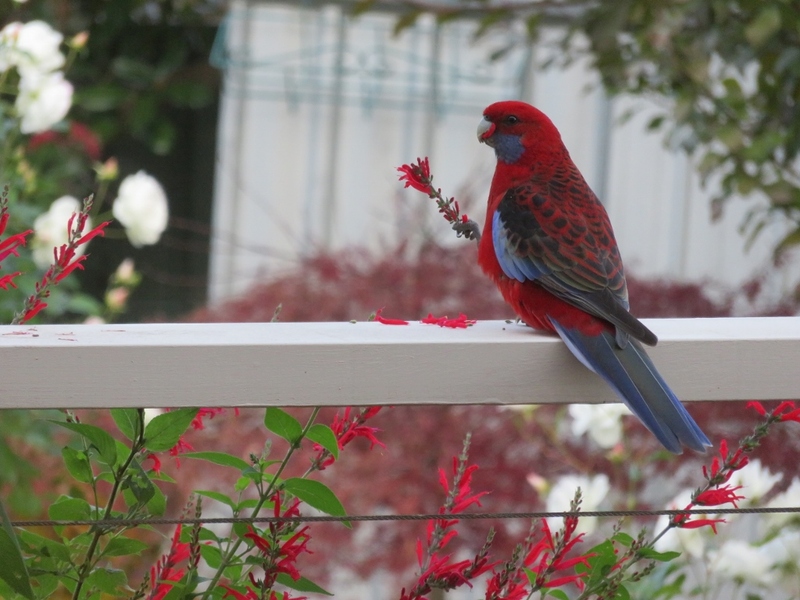 Thanks Brenda … The birds just love the Peppermint Sage.. 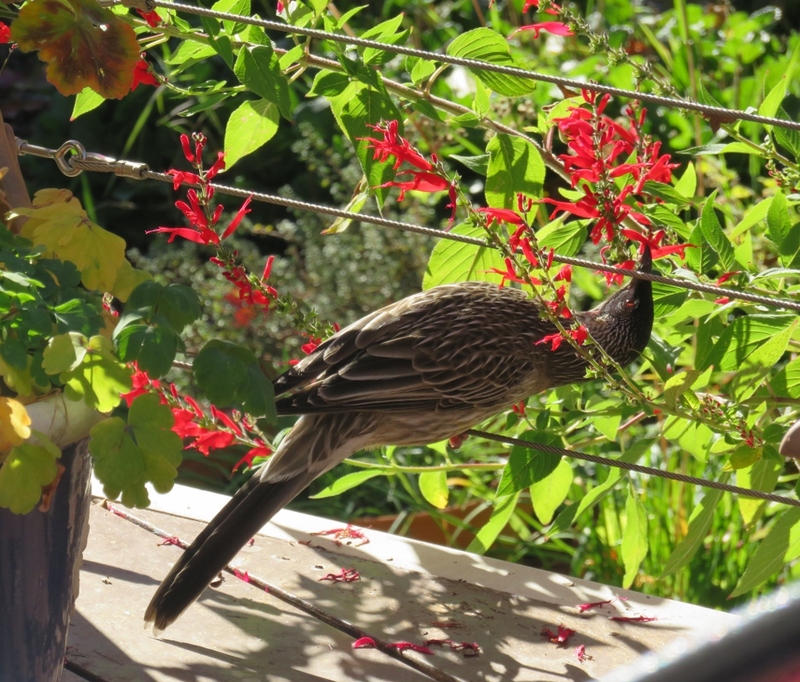 The pineapple sage is a lovely plant to have in the garden & I found it quite by accident .. Lucky for the bird life!